ReNew Power Ventures Pvt. Ltd is close to acquiring Ostro Energy Pvt. Ltd, the company that holds the renewable energy assets of buyout firm Actis Capital, for an enterprise value of Rs10,000 crore, according to two people directly aware of the development. The final valuation has been agreed by both sides, the people said, requesting anonymity. “The equity portion of the transaction is close to Rs2,000 crore, while the rest will be debt,” one of the two people said. The transaction, if successful, will consolidate ReNew Power’s position as the largest renewable energy company in India, where small and mid-sized project developers are looking to sell their assets in an industry that has seen a sharp increase in competitive intensity and plunging tariffs. The long-term growth strategies for smaller and mid-sized companies have come under pressure because of the limited amount of supply this year, and only the most well-capitalized groups were able to actually win tenders, said Rahul Goswami, managing director of Greenstone Energy Advisors Pvt. Ltd, an advisory firm. According to the people cited above, ReNew Power, which is backed by Goldman Sachs, has approached a foreign and domestic investment bank to finance the deal. “More lenders are expected to come on board once the transaction nears completion,” said the second person. Mint reported on 7 November that ReNew was in active discussions with Ostro to take over the latter’s 648.1 megawatts (MW) of operational wind projects and an additional 460MW of wind and solar capacity that is under construction. Ostro plans to build 1,000MW of renewable energy projects by 2019. Mint had also reported that Bank of America Merrill Lynch was given the mandate by Actis to find a buyer for the asset. Sanjiv Aggarwal, a partner at Actis, could not be reached for comments. In February 2015, Actis committed $230 million to create the renewable energy platform Ostro Energy. The renewable energy developer has operating projects in Andhra Pradesh and Madhya Pradesh. An additional 250MW of solar projects are under construction in Gujarat. “ReNew will pay a significant control premium for the asset as there aren’t many of this size available in the market,” said the first person. 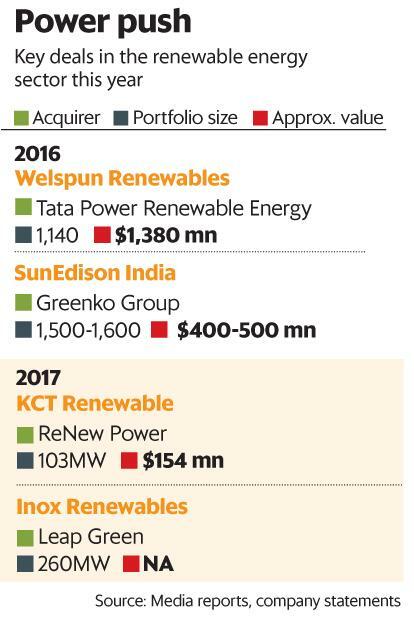 Once the transaction is completed, ReNew Power will consolidate its position as the biggest renewable energy company in India, widening its lead over Tata Power Renewable Energy Ltd, the second-largest. As of November, ReNew Power had operational capacity of around 2.4 gigawatts (64% wind and 36% solar). In addition, the company has about 899MW of power projects under implementation or at a planning stage. The transaction is also expected to bolster ReNew’s initial public offering (IPO) plans. Mint had reported in May last year that ReNew had started the process for an IPO with a request for proposal to hire bankers for the share sale. The plan was shelved later. ReNew Power was founded by Sumant Sinha, a former chief operating officer at wind turbine maker Suzlon Energy Ltd, in 2011. The company, which is majority owned by Goldman Sachs, has received investments from Asian Development Bank, Abu Dhabi Investment Authority and Global Environment Fund. In February, Japan’s JERA Co. Inc. bought a 10% stake in ReNew Power, valuing the company at $2 billion. The Economic Times reported in November that Canada Pension Plan Investment Board was looking to buy a 14-15% stake in ReNew Power for $350 million.